The beginning of spring always inspires new beginnings. 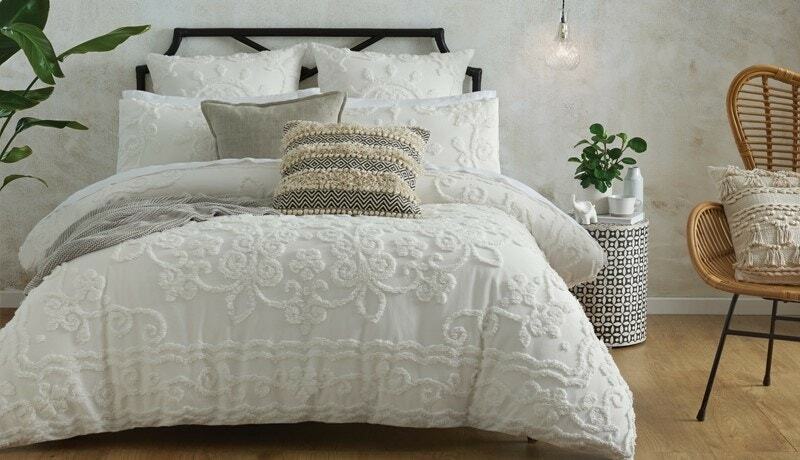 New season, new look, and new bed linen! But, which style is right for you? Combining a natural Scandinavian palette with the creative and artful touch of Bohemian style, your style is understated and effortless and your home is no exception. Filled with a curated collection of new and old, you gravitate towards décor that is considered, yet artisanal and personality-filled. Our new tufted chenille, the enduringly stylish Farrah quilt cover, and our Milano linen sheet set for that effortless, lived-in look. Relaxed and versatile, this look works in minimalist settings just as comfortably as in eclectic spaces. Keep it neutral with natural materials and earthy tones, using rich textures and embellished details to balance this white-on-white style. Add touches of greenery for a laid-back ambience that connects the inside and out. Insider Tip: Boho is an expression of personality rather than a defined style, so be sure to keep your space an expression of you! The forever traveller, you love colour, pattern and playful details. Your house feels collected rather than decorated, with unique, one-of-a-kind treasures from your travels around the world. A little eclectic, a little artisanal, a little Bohemian – your style is as colourful and diverse as the cultures from where inspiration was drawn. Our newest summer arrival, the Fiesta quilt cover! Inspired by the colourful patterns and folk art of South America, more is more for this playful celebration of tradition. 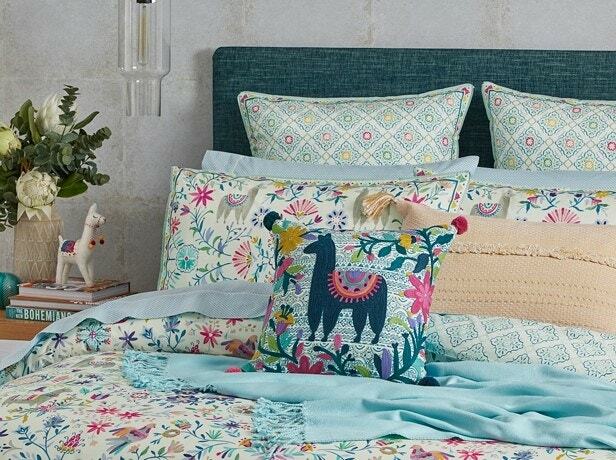 Pair pattern on pattern with our Sasha sheet set and whimsical Fiesta Llama cushion. 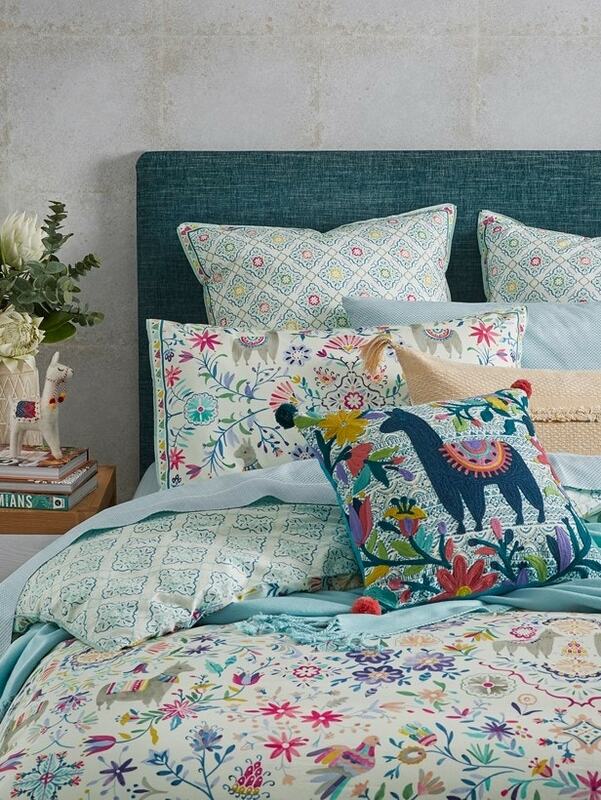 Draw upon the whimsical elements found within the Fiesta quilt cover, and play with different textures, colours and patterns to create a truly unique space. Our hand-loomed Emerson cushion is the perfect complement to this globally inspired look. Not one to shy away from making a statement, you’re drawn to the bold and colourful. Channelling 1950s Palm Springs, your love affair with Mid-Century Modern style often finds you seeking that next perfect piece for your home, albeit with a twist of tropi-cool. 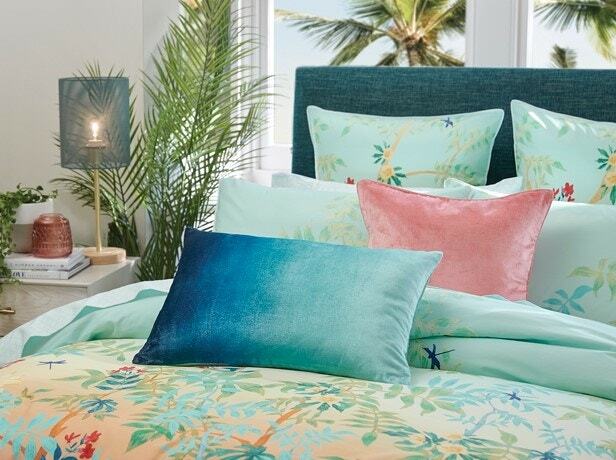 Tropical goes retro with the Twilight quilt cover. A landscape of hand-painted tropical leaves and flowers are set against an ombre background to capture the feeling of a warm summer evening. 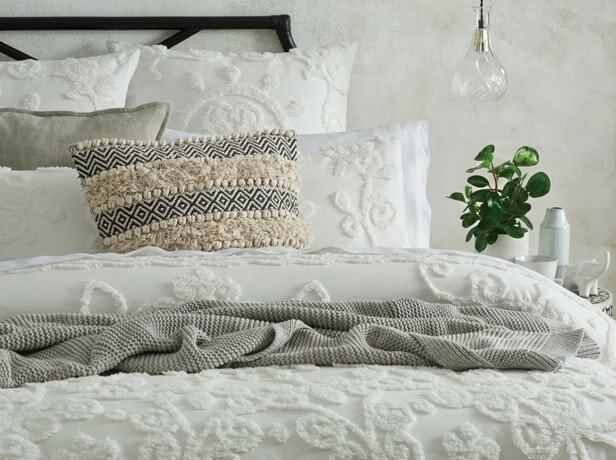 The subtle Mateo sheet set completes this tranquil look. 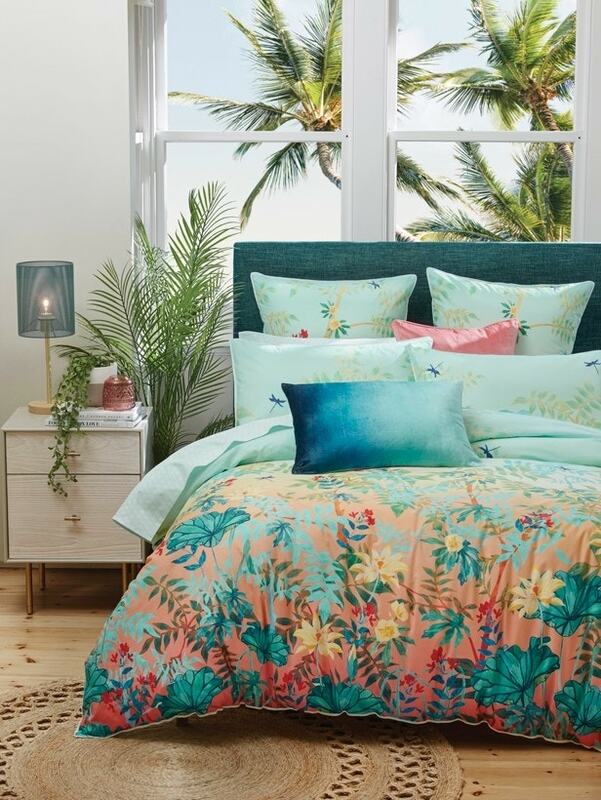 Tropical greenery is right at home in this sun-kissed scene, and is a must-have as you channel tropical island luxe. These organic elements contrast beautifully with hints of metallic accents and luxe velvet accessories, like our Margot Ombre Velvet cushion and Margot Velvet cushion. 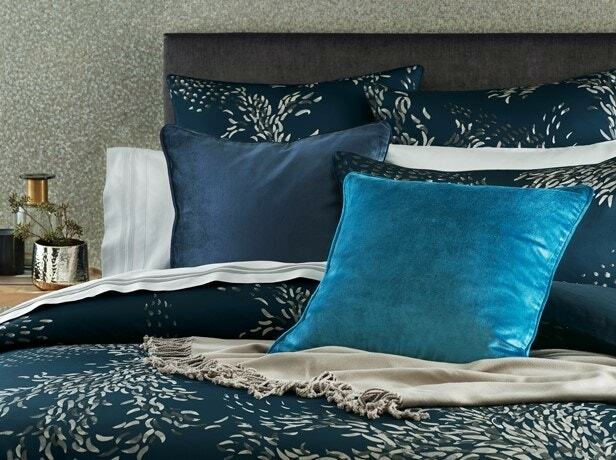 Insider Tip: A prominent characteristic of tropical luxe is its colour palette, so embrace the bold! Your go-to style is one of enduring elegance. Think luxe finishes, rich tones and decadent details. Modern and sophisticated with a nod to Art Deco, your home celebrates luxury and high-end design. Introducing the Palmeria quilt cover. A fluid, calming movement is captured in this abstract, hand-painted design, which exquisitely combines textured paint strokes with a bold palette for a distinctive air of contemporary elegance. 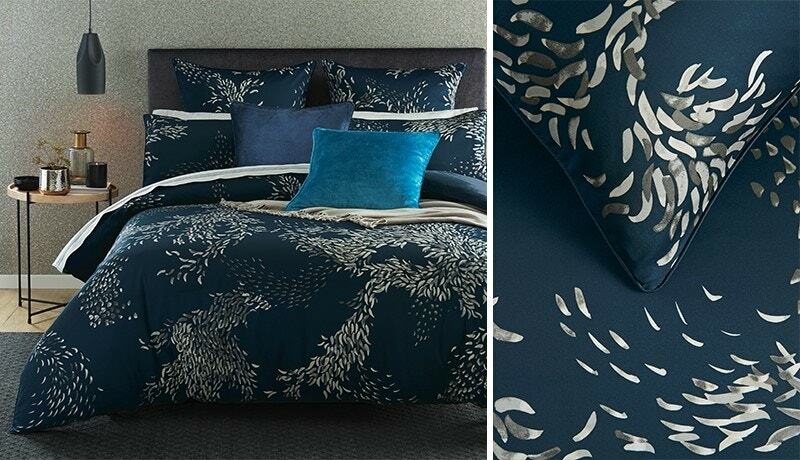 A luxe look fit for a city penthouse apartment, pair with high-end, silky-soft sheets for everyday luxury. Sumptuous layers of luxe textiles and opulent homewares are key. Deep, moody velvet accents (our Margot Velvet cushions are the perfect complement) and metallic finishes will elevate this modern look to an enduring aesthetic of sophistication and style.